I hope that you all have a great weekend. 1775—Abraham Whipple takes command of Rhode Island's coastal defense ship, Katy, and captures a tender of HMS Rose. In December, Katy is taken into the Continental service and renamed Providence. 1864—During the Civil War, the side-wheel steamer, USS Lexington, commanded by Lt. George Bache, and a boat crew from the side-wheel steamer, USS Tyler, capture three steamers aiding Confederates off Beulah Landing, MS.
1944—Following intensive naval gunfire and carrier-based aircraft bombing, Task Force 52 lands the Marines on Saipan, which is the first relatively large and heavily defended land mass in the Central Pacific to be assaulted by US amphibious forces. 1956—USS Canberra is recommissioned as (CAG 2) at Philadelphia Navy Yard, PA. She was previously a Baltimore-class heavy cruiser. 1963—The combat stores ship, USS Mars (AFS 1), is launched. She is the first of a new class of underway replenishment ships that combines the functions of the stores ship (AS), the stores issue ship (AKS), and the aviation supply ship (AVS). 2017—The Navy releases the results of a comprehensive review to determine causes of and make recommendations to eliminate physiological episodes within Naval Aviation. Physiological episodes occur when aircrew experience a decrease in performance due to the cabin pressure fluctuations, contamination of breathing air, or other factors in the flight environment. Steps recommended to reduce the episodes include improved aircraft oxygen systems, increased inspection requirements and establishing an integrated life support system program at Naval Air Systems Command. 1943—At Guadalcanal, Solomon Islands, Japanese aircraft conduct the largest raid since April 7. Although a large number of enemy planes are shot down, LST-340 and USS Celeno (AK 76) are damaged. 1953—During the Korean War, USS Princeton (CVS 37) launches 184 sorties against enemy front-line positions, a new record for offensive sorties flown from a carrier during the Korean War in a single day. 1959—A P4M "Mercator" is fired on by two North Korean MiG aircraft while on a routine flight over international waters off Korea. The attack wounds one crewman and damages the plane, forcing an emergency landing at Miho, Japan. 1965—The US Navy schedules the reactivation of USS Repose (AH 16), which is the first hospital ship active for the Vietnam War. 1990—USS Monterey (CG 61) is commissioned at Mayport, FL. The Ticonderoga-class guided-missile cruiser is named for the Battle of Monterrey during the Mexican-American War in 1846. 1910: The first Father's Day was celebrated in Spokane, Washington. 1929: Otto E. Funk, 62 years old, ended a marathon walk from New York City to San Francisco. He traveled 4,165 miles in 183 days, playing his violin all the way. 1963: Soviet cosmonaut Velentina Tereshkova becomes the first woman in space, even though Ralph Cramden kept promising Alice that she would go right to the moon! 1974: Homer Simpson & Marge Bouvier wed.
1815—Commodore Stephen Decatur's squadron engages the Algerian flagship Mashouda near Cape de Gatt, Spain. Though the Algerian frigate maneuvers actively to escape, she surrenders after 20 men, including her commander, are killed. 1833—The ship of the line, USS Delaware, becomes the first warship to enter a public drydock in the United States when secured at Gosport Navy Yard in Portsmouth, VA.
1870—Under the command of Lt. Willard H. Brownson, six boats from the steam sloop-of-war USS Mohican attack a group of pirates in the Teacapan River, Mexico. 1898—President William McKinley signs into law a Congressional bill authorizing the establishment of the U.S. Navy Hospital Corps. 1944—TBF (VC 95) from USS Croatan (CVE 25) damages German submarine (U 853) in the North Atlantic. On May 6, 1945, USS Atherton (DE 169) and USS Moberly (PF 63) sink (U 853) off Block Island. 2017—The guided missile destroyer USS Fitzgerald (DDG 62) is involved in a collision with the Philippine-flagged merchant vessel ACX Crystal while operating about 56 nautical miles southwest of Yokosuka, Japan. Seven Sailors lose their lives and the ship is damaged on her starboard side above and below the waterline. Today's national news headlines are dominated with reports on the Department of Justice Inspector General releasing a report on the DOJ and FBI's handling of the Hillary Clinton email investigation, and reports the that Rep. Steve Scalise hit the field yesterdat\y in the Congressional Baseball game one year after he was shot during a practice for the annual event. Stars and Stripes reports that the Navy and Marine Corps have kicked off the 24th annual Cooperation Afloat Readiness and Training in Thailand, and that the exercise is aimed at strengthening professional skills with several Southeast Asian nations. USNI News reports NAVAIR Commander Vice Adm. Dean Peters told congress that Naval Air Systems Command will develop a facilities modernization plan to guide upcoming investments for three maintenance depots. Additionally, Secretary of State Mike Pompeo assured Asian powers on Thursday that the Trump administration still demanded complete denuclearization of North Korea in exchange for sanctions relief, according to the New York Times. King Magnus of Norway is defeated by his rival, Sverre. King John signs the Magna Carta. The English peasant revolt is crushed in London. Ottoman Turks crush Serbia in the Battle of Kosovo. Colonists in North America complete James Fort in Jamestown. Benjamin Franklin and his son test the relationship between electricity and lightning by flying a kite in a thunder storm. George Washington is named Commander-in-Chief by Congress. American General Anthony Wayne captures Stony Point, New York. Arkansas is admitted into the Union as the 25th state. Great Britain and the United States agree on a joint occupation of Oregon Territory. James K. Polk, the 11th president of the United States, dies. General J.E.B. Stuart completes his "ride around McClellan." The Battle for Petersburg begins. Henry O. Flipper becomes the first African American to graduate from the U.S. Military Academy at West Point. The U.S. House of representatives approves the annexation of Hawaii. Fire aboard the paddle steamer General Slocum on New York's East River kills 1,021, mostly German-Americans. President Woodrow Wilson signs a bill incorporating the Boy Scouts of America. Great Britain pledges the release of all Irish captured during the Easter Rebellion of 1916. Three African Americans are lynched in Duluth, Minnesota, by a white mob of 5,000. Republicans, convening in Kansas City, name Herbert Hoover their candidate for President. Gaston Means is sentenced to 15 years for fraud in the Lindbergh baby kidnapping. The French fortress of Verdun is captured by Germans. U.S. Marines begin the invasion of Saipan in the Pacific. The All India Congress accepts a British plan for the partition of India. Greece severs military ties to Turkey because of the Cyprus issue. The last French troops leave Algeria. The first general election in Spain since 1936 results in victory for the UCD (Union of Democratic Centre). Enjoyed the words about COL Boyd! Following is an excerpt from my ego-bio about how really important he proved to be to Fighter Aviation. The thing I didn't mention is that 6 years later, as Supervisor of Policy Studies at SHAPE NATO, I was honored to sponsor him in a presentation of his "egg concept" to the Supreme Commander. There was only one John Boyd! "The aftermath of the Vietnam War, and the international political situation of the late '70s, were not favorable to increasing F-14 production. Fleet air defense no longer drove the Navy's fighter aircraft budget. Heavy Air Force TACAIR losses in Vietnam cast doubts upon the fiscal possibility of rebuilding their force with expensive F-15s, although the Generals insisted the Eagle was their only choice. The result was increased Pentagon focus on the LWF program. At the forefront was an informal group referred to as the "Light Weight Fighter Mafia." The Mafia's unofficial leader was highly respected Chuck Meyers, Director of Defense Research and Engineering. Tom Christie and Pierre Sprey were dedicated members, as was enthusiast Air Force Colonel John Boyd. The sad fact was Boyd's unselfish desire, and untiring drive, to improve the Air Force, with affordable fighter aircraft, cost him a certain promotion to General. Our TACAIR offices were aligned in a long row on the Pentagon's prestigious "E" wing. Tom Christie's was at one end, equipped with a mahogany briefing table. Mine was at the far end, I had the largest wall-mounted blackboard. John Boyd was an expert at blackboard presentations, and he literally arrived in my office at 1600 every afternoon, to "run through" his latest project. I believed he was really seeking refuge from his Air Force colleagues, but Al Pryess and I thoroughly enjoyed his company, and greatly benefited from his super intellect on fighter aircraft and ACM. We were frequently joined by the rest of the Mafia. Tom enjoyed being away from his office, and telephone. In summation, the LWF program morphed into two proposals: General Dynamics' YF-16 , and Northrop's YF-17. Prototypes of both aircraft would be funded for a "fly off" competition. Since Northrop's CEO Tom Jones was a principle donator for President Nixon, it was assumed the winner would be pre-determined. They were lagging far behind in the competition when suddenly a thing called "Watergate" happened and everything changed. Northrop needed an immediate connection with an aircraft carrier experienced partner, and they found it in McDonald Douglas, which was facing an abrupt reduction in F-15 production. They also found improved engines, and the F-18 was born. Stole this from a book about John Boyd. "There is no such thing as an ex–fighter pilot. Once a young man straps on a jet aircraft and climbs into the heavens to do battle, it sears his psyche forever. At some point he will hang up his flight suit—eventually they all do—and in the autumn of his years his eyes may dim and he may be stooped with age. But ask him about his life, and his eyes flash and his back straightens and his hands demonstrate aerial maneuvers and every conversation begins with "There I was at…" and he is young again. He remembers the days when he sky-danced through the heavens, when he could press a button and summon the lightning and invoke the thunder, the days when he was a prince of the earth and a lord of the heavens. He remembers his glory days and he is young again." CIMSEC had the pleasure of asking The Honorable John F. Lehman, Secretary of the Navy under the Reagan Administration from 1981-1987, questions on his new book Oceans Ventured: Winning the Cold War at Sea. Q: Your tenure as Navy Secretary was guided by President Reagan's new national security strategy. 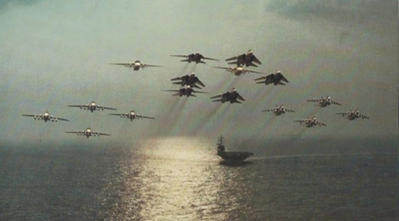 How did the 1980s U.S. Navy operationalize this new strategy? A: President Reagan was quite clear in his naval strategy and policy. Eight months before his election, he declared "We have to maintain a superior navy. We are a nation with vital interests and commitments overseas, and our navy must stay ahead of the Soviet buildup. This means commissioning the ships and developing technology which will enable the United States to command the oceans for decades to come." He believed strongly in the importance of confronting and negotiating with the Soviets from a position of strength – a position based on adequate and appropriate forces as well as the will and capability to use them should that ever be necessary. We in the Navy provided him that strategy. He fully embraced the force goal of a 600-ship Navy and its 15 carrier battle groups and 100 attack submarines, along with the tenets of The Maritime Strategy: Offensive, forward, global operations at sea and from the sea, as a critical component of an aggressive and forward total joint and allied strategy. In this he was fully supported by Secretary of Defense Cap Weinberger, myself as Secretary of the Navy, and a succession of Chiefs of Naval Operations. There was no daylight between any of us on these fundamentals. The strategy was operationalized through accelerating the Navy's building and deployment program; developing and promulgating suitable concepts and tactics; gaming those concepts and tactics at Newport and other institutions; and – most importantly and centrally – demonstrating, practicing, and analyzing them at sea, forward and throughout the world, from the very moment the President took office in 1981. This involved both a revamped forward exercise program as well as responding to real-world crises globally on a daily basis. In 1987, when the administration published its first formal public statement of its national security strategy, achieving and maintaining maritime superiority was enshrined as one of its bedrock ideas. Q: How did the Soviets respond to the new Maritime Strategy and how did it influence their operations and diplomacy? A: They were aghast. At first, they didn't know what to make of it, so they responded in kind: Throwing wave after wave of ships and aircraft at us wherever we popped up on their periphery – a periphery that they had long taken for granted as being their own backyard, and as vital launching space for further expansion. We were prepared for this, and indeed welcomed it, using their approaching forces as 'targeting services' to help refine our own tactics and to signal to them that the days of a free ride on the world's oceans had come to an end. They also redoubled their own building program, putting their naval industrial base into overdrive – and in the process helping wreck their own economy. Then, when they saw we weren't backing down, they began to tend to their own defenses, and started pulling in their horns, circling their wagons. This of course, was exactly what we had in mind, as it eased the pressure they had been putting on Norway, Japan, and other forward allies, and on American and allied forces facing them in Europe and Asia. They were particularly taken aback by the prowess of our commanders at sea in cover and deception operations. To kill a ship you need to find it first, and our commanders stayed up nights thinking up ways to bluff, trick, hide, and conceal their forces at sea so that they couldn't be found. They also railed against The Maritime Strategy loudly and publicly. "Remarkably odious," Izvestia snarled. "It is hardly possible to imagine anything worse." They had their own tricks, of course, in the form of American spies – sailors and government civilians – who were delivering our plans and orders to them by the trash bag-full. And they exploited these greed-heads to the maximum extent that they could. Finally—and this we hadn't planned as extensively for – they started a massive propaganda campaign calling for a wide range of naval arms control measures that would barely affect their own capabilities but that would hamstring us to a fare-the-well. Fortunately, not just the U.S. Navy but the U.S. nation rose to that challenge, dismissing their proposals for what they were – ploys to cut and constrain our vital naval capabilities while giving them the protection they now craved, and leaving us vulnerable to Soviet challenges at sea. At the very end of the decade, they began shutting down their far forward operations and facilities in Africa and elsewhere, and scrapping hulls that they had kept in their inventory far past their useful lives. But they continued – right up until the Soviet Union disappeared – to throw a multitude of new well-armed hulls in the water – a challenge we had to pay attention to until their country was no more. Q: How did American maritime superiority contribute to the end of the Cold War and the collapse of the Soviet Union? A: American maritime superiority made essential contributions. It ensured that their far forward forces – like those in Cuba, Africa, and the Indian Ocean – would not be available in a fight, and that our own considerable allied and forward forces always would be, reinforced and resupplied from North America. Maritime superiority meant we could threaten them from all directions, at once or serially, flexing our forces to come at them in the Norwegian Sea, the Arctic, the eastern Mediterranean, and the western Pacific, and reinforcing their need to protect and defend their forces close to their homeland, instead of surging out into the broad oceans and threatening our own shores. American maritime superiority meant that their strategic ballistic missile submarine force – on which their warfighting doctrine relied as a necessary nuclear strategic reserve – was not going to survive the early days of a war, should our president so decide. Finally, American maritime superiority meant that they could never catch up. We would always strive to be ahead of them – and succeed, no matter how many new ship classes they constructed or spies they paid off. As President Gorbachev plaintively remarked in 1989 to President Bush on board the Soviet cruise ship Gorky off Malta, "We are encircled by your Navy." Q: The book takes its title from a major exercise, and it is heavily focused on exercises throughout. Why this specific focus? Why are these exercises valuable for naval forces and national security writ large? A: The Maritime Strategy included a host of interlocking initiatives, but none were more important than the forward at-sea exercises. Like other exercises, they had a number of vital and worthy goals: To train, to test, to experiment, to practice, to hone. But much more importantly, these exercises – especially the very earliest ones like Ocean Venture '81 in the Norwegian Sea and its initial companion exercises in the North Pacific – were designed to – and did – send the most powerful of all signals to the Soviets: Presidential candidate Reagan's "peace through strength" campaign motto was now firm U.S. policy, not a discarded slogan. They also signaled to the plucky Norwegians, our other NATO allies, the Japanese, the South Koreans and others that we once again "had their back." We really did. And they signaled to those naysayers among the defeated Democrats and in ground combat-oriented American and allied headquarters to get on board, because this President and his like-minded appointed officials were serious, and in charge. And yet – despite all that has been written about The Maritime Strategy and its effects – including my own work – there hasn't been much attention paid to the exercises. Operators go to sea and scribes do the writing, and the scribes – even the operators among them – have short-changed the role of the exercises in favor of learned dissections of the role of secret intelligence or wargaming, or exegeses on the evolution of the documents, or any of the many other elements that came together to comprise the "perfect storm" of The Maritime Strategy. This book is intended to put some balance into what had become an important – but unbalanced – literature (see my bibliography). And to pay tribute to the brave and clever Navy operators who devised and carried out these maneuvers – many necessarily in atrocious weather – in the Arctic, the Barents, the Norwegian Sea, the Med, the Sea of O, the Sea of Japan, and elsewhere. Q: These exercises were often led and designed by leaders with a wily reputation, leaders like Admirals Hank Mustin and Ace Lyons as you discuss in the book. What distinguishes great operational and tactical innovators such as these men? A: The U.S. Navy is certainly fortunate to have among its numbers a goodly share of "operators" – seamen, aviators, and tacticians who enjoy going to sea and putting warships, aircraft, and their crews through their paces. For them, it's the ultimate in "fun and zest," as my old mentor Admiral Bud Zumwalt used to say. They aren't hard to find in the Navy – everyone knows who the "sea dogs" and "good sticks" are. But it can be hard to place them in senior operational positions where their talents can shine. One of the most important jobs a Secretary of the Navy has to participate in is the identification of those stalwarts, and then ensuring they get assigned top jobs where they can do the most good. I spent a fair amount of time on that when I was secretary, and I believe most of my choices panned out well. And so did the Soviets (see the vignette in the book where post-Cold War Russian admirals are crowding a window to get a glimpse of Ace Lyons at a conference). Speaking of Ace, he illustrates another important point as well: Many of the Navy's most skilled operators are also among its most well-educated and experienced in naval strategy, policy, and global fleet operations. Again, the trick is to identify these folks early on and develop them with alternating sea and shore tours and repeat tours in plans and policy billets so that they can get the necessary breadth and depth of experience once they reach high flag rank. Ace was a famous ship-driver and deception specialist at sea, but he also had had four tours in OP-06 (today's N3/N5) before being promoted to flag (well before my time, incidentally), as well as tours as a student at both the Naval War College and the National War College. All that, plus his drive, brains and imagination, made him a formidable Navy leader. Hank Mustin – the other famed mariner you mentioned – had a similar special background, including student tours at the Naval Postgraduate School and the Naval War College, a combat tour on the rivers of Vietnam, and several OPNAV tours in surface warfare planning and crafting CNO Zumwalt's Project SIXTY – an ancestor of The Maritime Strategy. So the Navy has these men and women – with the right education, experience, aggressive mindset, and imagination. It's up to the top leadership to develop their careers sensibly and move them quickly into the most demanding top positions, even if it means goring some sacred cows like cookie-cutter career patterns and "Buggins's turn." Q: You described a "virtuous circle" that kept strategy current and evolving. As described in the book, it consisted of fleet exercises that fed into the work of key institutions like the Strategic Studies Group, the Center for Naval Analyses, the Naval War College, and others, who then informed new fleet exercises. Please discuss how this virtuous circle worked. A: It worked in a number of ways, all essential. First of all, there were the formal linkages. For example, the Navy's educated and experienced strategists in OP-603 crafted Maritime Strategy briefings that were used by OPNAV and the Secretariat to kick off the POM development cycle each year. Many OP-603 officers had had Naval War College or similar civilian educations that had taught them the principles of naval strategy. These experts also briefed their products to the CNOs and myself, to the Strategic Studies Group (SSG) and the professoriat at Newport, and to a host of others – in the other services, on the Hill and overseas, for example. They listened as much as they briefed, and brought useful new insights back with them to update and polish their briefings. Meanwhile, I was providing the essential political direction that was sorely needed to shift the Navy to a more aggressive posture, and my staff ensured that my speeches and other emanations found their way to OP-603, the SSG, and other homes to direct and influence the growing strategy and the 600-ship Navy program. It took a couple of years of this iterative process before the ever-changing and ever-improving slide decks could be converted to actual documents, but they eventually were. Having benefitted from all these inputs, they proved extraordinarily influential. Meanwhile, the SSG used its freedom and high-level access to explore extensions, variants, and alternatives to facets of the strategy, and fed them to myself and the CNOs. Some then found their way into the next iteration of the strategy briefing. The fleet commanders – supported by their seagoing CNA operational analysts – debriefed their strategy-influenced exercises extensively, within the Pentagon and on the Hill. Programmers and budget-crafters thus heard firsthand how the strategy – and their programs – were faring forward at sea, facing off against Soviet Backfire regiments and submarines. And they learned what needed changing. Meanwhile once per year, the Naval War College convened a Global War Game to examine elements of the strategy. Players included SSG staff and fellows, Hill staffers, OP-603 strategists, Naval War College and Naval Postgraduate School professors, unified command reps and, of course, the fleets and others. They took back to their commands and offices and classrooms the insights they had gained from the games, and submitted recommendations to the gamers on what might be done better or different next year – and to OP-603 to revise their baseline. Overlaid on all of this were inputs from the Navy's intelligence officers and CNA, which injected important and counter-intuitive "Red" views into the strategy concepts and media, and enabled the strategy to be further developed at various levels of classification. Then too, The Maritime Strategy benefitted from the Navy's rotation policies – when intelligently applied. Conceptualizers and practitioners swapped positions regularly. Examples abound: Ace Lyons went from running Ocean Venture and other Maritime Strategy exercises to serving as OP-06, responsible for updating the strategy briefings and documents, then on to the Pacific Fleet, to apply what he knew in the waters off Kamchatka and Vladivostok, through imaginative use of a revitalized and forward-operating Third Fleet. Hank Mustin likewise went from running imaginative exercises as COMSECONDFLT/ COMSTRKFLTLANT ("Mustin in the Fjords") to OP-06. And it wasn't only the flags: CAPT Larry Seaquist, for example, came down from the SSG to run the OP-603 strategy shop, then went on to command USS Iowa at sea in Maritime Strategy exercises, and then on to strategy staff positions on the Joint Staff and OSD. CDR Ray Conrad – one of the Navy's pre-eminent NATO experts – moved from OP-603 to a destroyer command in which he "walked the talk" in frigid North Pacific exercises, and then moved on to NATO headquarters where he inculcated a generation of allied officers and civilians in the Maritime Strategy's principles. He was joined there by Peter Swartz, with whom he had earlier worked in OP-603. Swartz subsequently was picked up by CJCS GEN Colin Powell as a Special Assistant during the Gulf War. And so it went. By the end of the decade, the upper reaches of the Navy – and the Pentagon and the National Security Council Staff – were shot through with officers who had served in a variety of guises in developing and implementing the Strategy, and who also served as mentors to the follow-on generation. Q: The Navy of 1980 was in many ways still suffering from a post-Vietnam War malaise and had to shift from a power projection focus toward sea control against a great-power adversary, while still maintaining full-spectrum competence. A similar problem exists today. What did it take to reset the Navy's mindset and skills to meet this challenge? A: Well, that's not quite accurate for the 1980s, although it does square with CNO ADM Zumwalt's views in the early 1970s. What we faced in the 80s was the need to plus-up and advance both sea control and power projection – and strategic deterrence, strategic sealift, and forward presence to boot. We needed more carriers and strike aircraft, more and better amphibs and landing craft, more attack submarines that could work under the ice, more prepositioning and sealift ships to get the Army, Air Force, and Marine Corps where they needed to go. Also, we needed to rapidly introduce into the fleet Tomahawk missiles, Aegis cruisers, Vertical Launching Systems (VLS), and a whole new family of strategic nuclear ballistic missile submarines. We had to do it all. We were up against the Soviet superpower, armed to the teeth and deployed worldwide. And not just their Navy, but the Red Army, Red Air Force, and Soviet allies and clients too. (1) Development and promulgation of a global, forward, and aggressive Maritime Strategy that laid out what we needed to do and how and where we needed to do it, continually re-conceptualized, exercised, gamed, analyzed, discussed, and improved. (2) A funded force goal of 600 ships, including 15 carrier battle groups, 4 battleship SAGs, 100 attack submarines, amphibious lift for a Marine Amphibious Force and a Marine Amphibious Brigade, and cruisers bristling with Tomahawks and Aegis. (3) A vigorous campaign to drive and keep costs down, including restoring accountability and authority to officials, not bureaucracies, fixed price contracting, fostering competition, enforcing contract discipline, using common subsystems, technological innovation through block upgrades, terminating unproductive research and development programs, controlling gold-plating and design changes, and cutting bureaucratic layers. Q: The United States has long been a maritime power. China, after millennia of focusing on continental power, is only recently but seriously focusing on developing its maritime power as a core component of its rise. Russia's maritime power is a shadow of its Soviet past. What does history tell us about the value of maritime power for great powers and competition between them? A: Great powers are not great powers without maritime power. And superpowers are not superpowers without maritime superiority. The United States – and, indeed, the entire world – has benefitted greatly from our acting as a superpower ever since World War II. That continues today. It would be a tragedy of the first order – for ourselves and all others—to allow our position as a superpower to slip. Central to maintaining superpower status, however, is maritime superiority. It is U.S. maritime superiority that guarantees freedom of the seas for the world's commerce, connects us to our allies and innumerable interests around the world, and enables us to use the seas as a decisive global maneuver space, in peace and war. In my six years in office, under President Reagan, America was spending almost six percent of our gross domestic product (GDP) on defense per year. That investment contributed mightily to our winning the Cold War. Today we are spending just a little over three percent. Given the plethora of challenges that Secretary of Defense Mattis laid out in his recent National Defense Strategy, it is difficult to understand how we will be able to continue to counter those challenges in the future, absent a deeper financial commitment from the American people and their representatives to maintain our maritime superiority and thus our status as the world's essential superpower. It is the right and necessary thing to do, for ourselves and the world, and as the richest power on earth we can afford it. America can and should do this. And that maritime superiority must be exercised worldwide and forward. Nelson beat Napoleon off Egypt and again off Spain, not off England. John Paul Jones fought the British off Yorkshire, not off New York. In the earliest and darkest days of World War II, we launched Army bombers from Navy carriers and bombed Tokyo. We won the Cold War at sea off the Kola, Kamchatka, Vladivostok, in the Eastern Med and under the Arctic ice, not off San Diego or Norfolk. Superpower maritime superiority demands forward operations "in harm's way." So we must be manned, trained, and equipped to fight and win globally and forward. Q: Any final thoughts you would like to share? A: I write this on Memorial Day. We can never forget those who sacrificed so much to bring us where we are in the world today. Sailors, Marines, Soldiers, Airmen, Coast Guardsmen, and civilian government workers and contractors have all given their lives to keep us strong, free, and prosperous. This includes some who died during the very exercises and operations I recounted in my book. They were critical to our winning the Cold War, and we must never forget them. The Hon. John F. Lehman Jr. is Chairman of J.F. Lehman & Company, a private equity investment firm. He is a director of Ball Corporation, Verisk, Inc and EnerSys Corporation. Dr. Lehman was formerly an investment banker with PaineWebber Inc. Prior to joining PaineWebber, he served for six years as Secretary of the Navy. He was President of Abington Corporation between 1977 and 1981. He served 25 years in the naval reserve. He has served as staff member to Dr. Henry Kissinger on the National Security Council, as delegate to the Force Reductions Negotiations in Vienna and as Deputy Director of the U.S. Arms Control and Disarmament Agency. Dr. Lehman served as a member of the 9/11 Commission, and the National Defense Commission. Dr. Lehman holds a B.S. from St. Joseph's University, a B.A. and M.A. from Cambridge University and a Ph.D. from the University of Pennsylvania. He is currently an Hon. Fellow of Gonville and Caius College, Cambridge University. Dr. Lehman has written numerous books, including On Seas of Glory, Command of the Seas, and Making War. He is Chairman of the Princess Grace Foundation USA and is a member of the Board of Overseers of the School of Engineering at the University of Pennsylvania. Dmitry Filipoff is CIMSEC's Director of Online Content. Contact him at Nextwar@cimsec.org. Item Number:2 Date: 06/15/2018 ALGERIA - FORMER AQIM LEADER RUMORED TO BE ALIVE IN SAHEL (JUN 15/MIDEEYE) MIDDLE EAST EYE -- A notorious Algerian terrorist leader may still be alive despite numerous claims of his death, reports the Middle East Eye (London). Mokhtar Belmokhtar, a leader previously affiliated with Al-Qaida in the Islamic Maghreb (AQIM) and a successor organization, Al-Mourabitoun, is still alive, according to Libyan security sources cited by the Arabic-language Al Majalaa (London) magazine. The terrorist leader is living in the border region of Chad, Niger and Mali, captured ISIS fighters told the news magazine. U.S. forces previously reported that Belmokhtar was dead in 2013, 2015 and 2016. The sources also said that Belmokhtar had allowed some within Al-Mourabitoun to cooperate with the Islamic State, while maintaining public loyalty to Al-Qaida. Yahya Abu al-Hammam allegedly served as an intermediary between the group and ISIS fighters in Libya and Niger with the approval of Belmokhtar, said the captured militants. Abu al-Hammam has also been seen with Iyad Ag Ghali in a video announcing the formation of a new Al-Qaida affiliated group in Mali, Jama'at Nasr al-Islam wal Muslimin (JNIM). An Algerian security source cast doubt on the claims, pointing out that there have been no known contacts between Abu al-Hammam and Belmokhtar since 2012 or 2013. Belmokhtar would also be unlikely to work with ISIS, which sentenced him to death in 2015, the source said. Item Number:8 Date: 06/15/2018 MONGOLIA - MULTINATIONAL PEACEKEEPING EXERCISE KICKS OFF NEAR ULAANBAATAR (JUN 15/XIN) XINHUA -- The Mongolian military is hosting the annual Khaan Quest international peacekeeping exercise at the Five Hills Training Area near Ulaanbaatar this month, reports Xinhua, China's state news agency. The exercise began on Thursday and is scheduled to conclude on June 28. A total of 1,400 troops from 26 counties are taking part in the drills, including Mongolia, the U.S., China, Russia and Germany. Bhutan and Qatar will also participate for the first time. The exercise consists of a command-post exercise and field training covering peacekeeping and stability operations. Drills include checkpoint control, combat casualty care, water patrolling and civilian protection. The Khaan Quest drills were launched in 2003 in cooperation with the then-U.S. Pacific Command and United Nations. It became a multinational exercise in 2006. Item Number:15 Date: 06/15/2018 USA - NAVY SEEKS TO EXTEND RANGE OF MK 48 TORPEDOES (JUN 15/DN) DEFENSE NEWS -- The Office of Naval Research has awarded Aerojet Rocketdyne a contract to enhance the engine on Mk 48 heavyweight torpedoes, reports Defense News. The $2.6 million contract covers the initial development of a prototype torpedo propulsion system, with the goal of improving the efficiency of the Mk 48 engine, said an Aerojet Rocketdyne release on June 12. The first phase, which could run for up to 24 months with options, will evaluate ways to increase engine efficiency, while a potential second phase would include integrated full-scale system testing. The goal is to keep submarines farther from potential targets and allow third-party sensors, such as maritime patrol aircraft, to relay targeting data, said analysts. At ranges of 50 miles (80 km) or more, the sub is unlikely to give away its position. Torpedoes fired at such ranges take some time to reach their targets, creating new problems that will have to be resolved, experts said.